Kākābeak is named for its beautiful red flowers, which hang in clusters of 15-20 blooms and are shaped like a kaka's beak. Ngutukākā has a long-lived seed which may still be able to germinate after 30 years, creating a seed bank that holds many seeds ready to germinate when conditions suit. This enables it to grow in shrubland which is not permanently open but is frequently disturbed. The seeds wait for light gaps to appear, e.g. following a tree-fall or a slip, and then germinate in response. Plants can grow up to 2-3m tall, producing long, trailing stems that form new plants when they come into contact with the soil. In this way, one parent plant can cover a large area. Being a member of the pea family, Ngutukākā can fix nitrogen, enabling it to grow in infertile sites. Only around 150 plants are known in the wild. It’s widespread in cultivation, but there’s not a lot known of the genetic diversity of these plants or their provenance. Maori used Ngutukākā for gifting and trading, which makes it unclear what the pre-human distribution of Ngutukākā was. It has been reported as growing in Northland, Auckland, Great Barrier Island, Coromandel, around Lake Waikaremoana, and the East Cape and Hawke's Bay. Wild Ngutukākā is currently known to be at Moturemu Island in the Kaipara harbour, several locations near Ruatoria on the East Cape, Lake Waikaremoana, Ruakituri near Wairoa, and in Hawke’s Bay around Boundary Stream Mainland Island. Ngutukākā grows in open, sunny, steep sites, often on rocky outcrops, slips, the bases of cliffs or edges of lakes and streams. 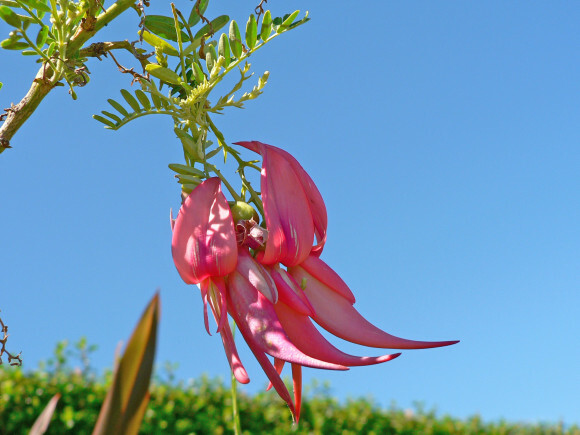 It is a relatively short-lived plant, sometimes lasting 15-20 years. Ngutukākā is a very nutritious plant and has no defences against browsing by deer, goats, pigs, hares, stock or introduced garden snails (which are often found in the wild). There is no evidence to suggest they are browsed by possums. Ngutukākā was noted as being uncommon in the wild as early as the beginning of last century. Introduced plants, such as Mexican daisy, gorse and buddleia, which compete for habitat, also threaten its survival as they like to live in similar sites. Hunters and Hikers are urged to report wild sightings to assist the survival of Ngutukākā. seed from wild plants in the Hawkes Bay have been collected and propelled onto steep bluffs and inaccessible sites, where browsing animals are unable to reach. Using a hydro-seeding method, the seed is propelled from a helicopter, enabling up to 80,000 seeds at a time to be returned to the wild. No concrete evidence has been recorded to date, but experts are hopeful in five to 10 years, bluffs and cliffs will be flourishing with red Ngutukākā flowers in its natural habitat. Ask DOC about using local plants if you live near a site where Ngutukākā grows naturally. DOC staff and the Ngutukākā Recovery Group Members are happy to talk about the best options and ways you can become involved in the recovery of Ngutukākā back into the wild. Your contribution will make the difference. We need your eagle eyes. 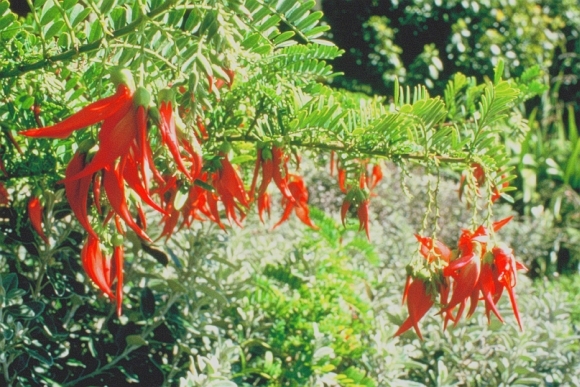 September and October is the best time of the year to spot Ngutukākā in the wild, because the plants are heavy with spectacular bunches of red flowers. If you are interested in helping protect this unique plant contact your closest DOC office.